You are visitor . This is your unique number to be checked by the TA. You must complete the first two exercises listed in the TOC and hand in the results at your next scheduled lab following the Tides and Waves Lab (i.e. at the start of the Weather lab). Exercise 3 is optional, but will give you an opportunity to use a Web based java program to construct tides using user specified harmonic components. Even if you don't do it for handing in, you should check it out. You will need a calculator for this portion of the lab, or you may access this Online Calculator. This web page compliments the EOS/GEOG 110 Lab on Tides and Waves in the Lab Manual. If you have a printer available, then you may print out products generated from the links on this page. Alternately, you can generate tables of tidal prediction numbers which can be transcribed to paper for handing in. Finally, you can describe the physical characteristics of the data and plots generated by the web applications. Alternately, you may have image software to better handle and print the images generated here. Often you can right-click on an image (although not from some JAVA applications) and save the picture to disk, email it, or copy it to the clipboard and paste it directly into image processing software (i.e. Paint Shop Pro). From there you may have more control over what you print and it's appearance. Ocean waves are oscillations in the water due to regions of either elevated or diminished surface height. Gravity pulls down the wave crests and buoyancy forces push up the wave troughs. Such waves are called gravity waves because both the downward pull of wave crests and the upward push of wave troughs is governed by gravity. They are generated by wind, tidal forces, and earthquakes and land-slides. In general, ocean waves can be divided into two categories: deep water waves and shallow water waves . 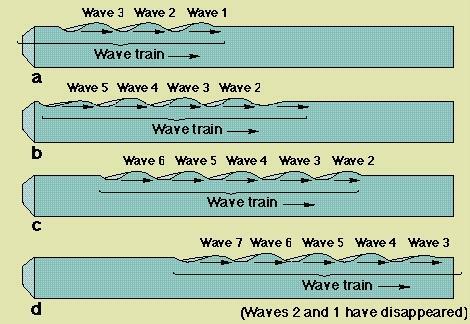 Usually, ocean wind waves are grouped into a train (or group ) of waves travelling together. Generally, if the wavelength, the distance between two wave crests denoted by is shorter than 1/2 water depth, then the wave is a deep water wave. If the wavelength is longer than 1/2 water depth, then the wave is a shallow water wave. As wind waves (swell) approach shallow water (i.e. a beach), they go from being deep water waves to shallow water waves. The deep orbital velocities start to feel the bottom and the waves slows down. Eventually, the wave slows to a point where the water particle velocities exceed the phase speed of the wave and the wave breaks (surf zone). There are two speeds associated with ocean waves: the phase speed (Cp) and the group speed (Cg). The phase speed is the speed that an individual wave travels with in the group. The group speed is the speed at which the group travels along. In the equation to the right for the phase speed, the wave frequency is given by and is in units of arc radians per second ( =2 f, where f is the frequency in cycles per second or Hz), k is the wavenumber = 2 / , where is the wavelength (distance from crest to crest measured in metres). g is a constant representing the force due to gravity (=9.8 m/ss). In deep water, the wavelength ' is a function of the wave period, the time it takes for an entire wave to pass by, and the group speed is half the phase speed, Cg = 1/2 Cp. Below is a picture showing how a group of waves travels, with individual waves appearing at the back and disappearing at the front. Generally, longer waves travel faster than shorter waves, a characteristic called dispersion. An ocean storm will generate surface waves of all wavelengths. However, the longest waves will travel away faster than the short wavelength waves, and at a distant beach, one will first experience the longest (and largest) waves from a distant storm, followed progressively by shorter and shorter wavelength waves. Since tides and Tsunamis are very long wavelength gravity waves, they travel very quickly. Their wave height however is small in deep water, and their presence is felt only near shore. 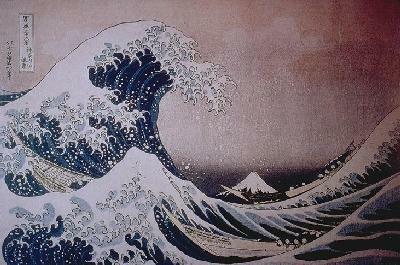 Tides and Tsunamis are shallow water waves, even in the deep ocean. Tidal waves and Tsunamis have wavelengths of hundreds of kilometres, and the ocean is typically 3500m deep, they are shallow water waves. A deep water wave is one with a wavelength shorter than the water depth. Ocean swell, with wavelengths of a hundred of meters or so, are deep water waves, until they approach the shore and the water depth becomes shallower than the wavelength (see image above). The wave height of a wave is measured from the trough to the crest, while the wave amplitude is half of the wave height. The phase speed of the wave is the time it takes a crest (a point of constant phase) to travel one wavelength. The group velocity of a wave packet (the equation shown above) is slower than the phase velocity, so waves appear to originate at the back of a wave group and die at the leading edge (see image on the right). Here is a link to Animated Waves of various types. Tides are a result of the gravitational attraction of the Moon and Sun on the ocean and Earth. This attraction manifests itself in two forms. First is the classical gravitational attractive force of the ocean to the centre of the Moon and Sun, respectively. The second is a centripetal force which results from the fact the Earth-Moon-Sun system of orbiting/rotating bodies represents a non-inertial reference frame with centrifugal accelerations. Think of an Olympic Hammer thrower. As they spin, they lean back away from the centre of mass, pushing mass away from the centre of rotation to maintain balance. The same is true of the spinning Earth-Moon and Earth-Sun systems. As they rotate about the centres of mass, there is an effective balance between the gravitational attraction and the outward centrifugal force. 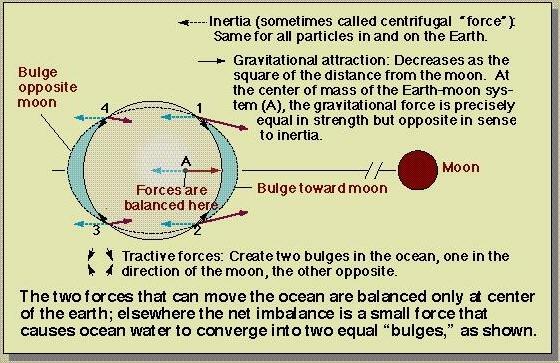 The sum of these two forces, the attractive force of gravity and the outward centrifugal force for both the Earth-Moon and Earth-Sun systems results in four primary "bulges" in the ocean: two associated with the Moon and two associated with the Sun. In simple terms, one "bulge" is directed towards each associated satellite (Moon or Sun), the second bulge is directed away from each satellite. The figure on the right shows the forces associated with Moon only. A similar figure could be drawn for the forces due to the Sun. However, even though the Sun is significantly more massive than the Moon, the relative size of the bulges caused by the sum of centrifugal and gravitational forces due to the Sun are smaller because of the great distance between the Sun and the Earth. Note also that the tides are larger near the orbital planes (nearer the Equator) than they are near the poles. If the Earth had no land masses protruding upwards through the ocean, then the tides would be a simple summation of these four bulges, slowly varying as the Earth-Moon-Sun orbits dictate. The Earth spinning underneath these bulges would cause approximately two high tides and two low tides each day. 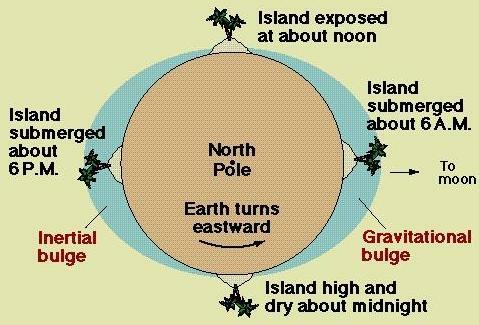 Shown on the left is an idealized view of the Lunar (Moon) tides looking down at the North Pole. For each revolution, the bulges towards and away from the Moon cause high tides, the "troughs" in between are the low tides. When we combine the effects of both the Sun and Moon we would end up with two high and two low tides each day. However, the Earth does have significant land masses protruding upwards in the ocean. 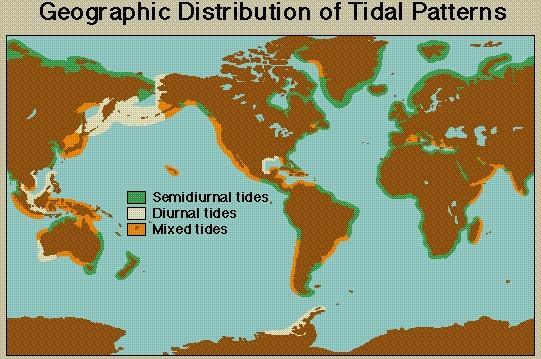 The tidal bulges, or tidal waves, are subsequently disrupted and steered by the continents and islands. As a result, the real tides at any one location in the ocean may be significantly more complicated than two high tides and two low tides each day. Generally, a location with semidiurnal tides experiences two high tides and two low tides each day, while a location with diurnal tides experiences one high tide and one low tide each day. Mixed tides means that there are two high tides and two low tides, but one of the highs and one of the lows is larger than the other. To explain all the possible variations at any location, the tides are broken down into specific harmonic components (each being a simple wave), associated with physical astronomical characteristics. Each tidal constituent is a simple wave with an amplitude and a phase (starting point). By setting the amplitude and phase for each constituent, the sum of these simple waves can equal the observed tides. This will become clearer following the exercises below. Exercises 1 and 2 will help you understand tides at different locations and how they vary. Exercise 3 will have you retrieve real time wave data from wave buoys located along the coast of BC and WA. There are three physical characteristics which define an ocean wave: the wave height (h), the wavelength ( ), and the wave frequency ( = 2 f). The wave period T is just T = 1/f, where f is the wave frequency in cycles per second or Hz. As noted above, the wave speed depends on the wavelength and the wave period, but not on the wave height. In this exercise you will access live weather buoy data and investigate the local wind speed and direction and the local wave field. Using data retrieved from the wave-rider buoys west of Vancouver Island, you will calculate the approximate wavelength of the waves and their group speed. Wind speed is still often reported in knots. A knot is a nautical mile per hour, where a nautical mile is one minute of latitude. The conversion from knots (kts) to metres per second (m/s) is 1 kts = 0.55 m/s. Direction is reported in degrees from North. From the National Buoy Data Center you can access real-time wave data from buoys moored off the west coast of North America. Some of these buoys are Canadian (46036, 46206, 46134 and 46146). If you access the data for wave buoy 46036, you will be presented with information about the buoy and the most recent measurements made by it. You may wish to switch to metric units. Data for the last 24 hours can be retrieved by clicking on the symbol beside each data type. This will bring up a plot of the data for the last 24 hour period. For two buoys (i.e. 46036 and 46206), retrieve the most recent wave information. Record the wind speed and direction, and the wave height and dominant wave period. Assuming these are deep water waves, use the above formulae to convert the wave periods into approximate wavelengths ', and calculate both the phase and groups speeds of the dominant waves. Based on the wind direction for the last 24 hours, where do you think these waves are coming from? Does the wind direction agree with the latest Operational Met Chart from Environment Canada's Meteorological Data and Chart Page. (You may have to zoom in (IE has icon which appears in lower right corner), to see the image in full and find the buoy location.) Try to explain why they may, or may not agree (strength of wind, duration of wind, size of storm, etc.). For reference, a wave with a period of 5 seconds, will have an approximate wavelength of 39 m, a phase speed of 7.8 m/s, and a group speed of 3.9 m/s. A wave with a dominant wave period of 15 seconds will have a wavelength of 351 m, a phase speed of 23.4 m/s and a group speed of 11.7 m/s. Longer waves travel faster than shorter waves. Tides and Tsunamis are very long waves and travel very quickly. The second exercise will be to use a tidal prediction tool to generate a plot or table of tidal heights for Victoria and Tofino BC. There are numerous web sites that will do this. Here is one that has been around for a long time and uses the XTide program that is well established: XTide Tidal Prediction. Or you may use your favourite search engine (i.e. Google) to locate alternate tidal prediction facilities. The image at the top of this web page was generated with the PC version of this program which may be downloaded and installed on a local Windows PC. The present tides for Victoria can be displayed directly from the XTide website by sellecting VICTORIA (like the image at the top of this page). From the XTide Tidal Prediction page you can select one of thousands of tidal stations from around the world. I suggest you go the Alphabetic list of all tidal height sites (be patient, this is a large list) and first select tidal heights for Victoria, then Tofino, B.C. There may be several occurrences for any one site, pick the one which appears primary (T=primary, t=secondary). The default prediction generates a small table of tidal heights for the next few days. Use the advanced selection options located on the prediction page for both Victoria and Tofino to generate "clean" plots of the tidal heights for a month (4 weeks). 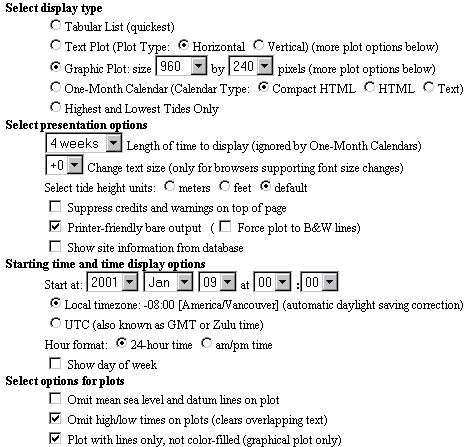 An example of these advanced XTide options is shown in the figure to the right. The default colors for XTide are blue for flood/rising tides and green for ebb/falling tides (see the figure at the top of this page). Use words to describe quantifiably the characteristics of the curves. The fort-nightly variation is the slow pulsing/changes over 28 days (one moonth). A purely semi-diurnal tide has two clear high tides and two clear low tides each day. A diurnal tide has one clear high tide and one clear low tide each day. A mixed tide will be some combination of semi-diurnal and diurnal, with one large high tide and one small high tide, and one large low tide and one small low tide. Describe the dominant characteristics of the tides at these two locations. Describe the number of high tides, low tides, small wiggles per day in the curves. When do they occur (i.e. at mid-night, mid-day), do they vary (in size and timing) throughout the fort-nightly period? Which site has a tide more semidiurnal, more diurnal (or mixed)? Do both sites have a fort-nightly variation in the tidal amplitude? If you plot, or predict the phases of the moon, when, relative to the phases of the moon, do the largest (spring) tides occur? When are do the smallest (neap) tides occur? This exercise will allow us to recreate the tides for a site using individual harmonic components. A harmonic component is a simple wave which represents the tidal influence at a given location due to each astronomical constituent. Our goal is to construct the tides from a limited set of harmonics (two to start with). For each harmonic constituent, we need to know the local amplitude and phase. The amplitude is the height of that constituent at that location, the phase tells us when in time that wave starts. At a new Moon, the phase of the Moon and Sun are aligned. We construct the tide by summing up to height contribution from different harmonic constituents with different amplitudes and phases. In other words, we can construct complicated tidal shapes by summing a number of simple waves, each with a fixed frequency associated with an astronomical phenomena, by setting the waves amplitude and when it starts (it's phase). A discussion of harmonic analysis of tides, and where the major harmonic constituents come from is available from SUNY Stony Brook (this is a slow link and this page may take a while to download). Tides at most locations in the world require more than two constituents. Often four is sufficient to account for most of the tidal height or current variation at a deep ocean site. Coastal sites require more constituents due to the interaction of the "tidal wave" with the coastal line, and the delays and amplification this causes. Although as many at 60 constituents may be included in a thorough analysis, eight (8) constituents is often enough to give the major timings and scales of coastal tides. Below is a list of 37 tidal constituents analyzed from sea level height observations made at Victoria BC (from the XTide data file). They are listed by Constituent name, followed by that constituents amplitude (in metres) and phase (in degrees, where a complete cycle is 360 degrees), relative to Greenwich. The importance of any one constituent is related to it's amplitude. For Victoria K(1) is the largest constituent, followed by O(1) and M(2). Follow this link for a further discussion on the frequency and origin of some of the primary Harmonics. From the above list, make a table of the eight (8) largest tidal constituents for Victoria. We will use this data to construct the tide at Victoria. Your list should look something like the constituents in the table shown below, which also includes the "speed" of each constituent in degrees per hour. To get the period of the constituent, divide 360 degrees (a complete cycle) by the speed. The answer is the period of that constituent. For example, 360/28.984=12.42 hours is the period of the M2 tide. It takes 12.42 hours to complete an M2 tidal cycle. Roughly half a day. Here is the link to evaluate the tide based on up to 18 Harmonic Components. Use it to generate a 30 day plot of the tides at Victoria using the eight (8) most important tidal constituents listed above. Note: this JAVA application allows you to select a plot of summed harmonics or single constituents listed by number. Also, you can edit the constituent table, modifying the names, amplitudes and phases of any listed constituent. I was able to	edit the eight constituents and title to reflect the tides for Victoria by "cutting" and "pasting" the above list directly into the constituent window of the Harmonic Components site. Does your 30 day plot resemble the plot generated by XTide (the time base is arbitrary)? What are the dominant similarities? What are the differences? Note that in the order listed, the first three constituents are semi-diurnal (twice a day). If you construct a tide based on the sum of the M(2), N(2) and S(2) constituents only, how many high and low tides occur per day? (i.e. plot 1 day). How many high and low tides if you sum 8 constituents? For the full 30 day plot, are there always only 2 high tides and two low tides per day? Here is a link to the 30 day figure showing what I got for all 8 constituents. The Institute of Ocean Sciences in Pat Bay, Sidney has conducted decades of tidal observations and predictions. The Canadian Hydrographic Service produce the Canadian Tide tables. Here is their tidal prediction/modelling site on Tides. This link also includes table generated tidal predictions for some sites in BC. The US NOAA agency has many interesting and related sites on sea level and tide. Here is there general interest page on Sea Level Height. The "restless tide" link has an additional explanation of tides. Another one of NOAA's Tidal Information Sites. The Smith and Sandwell analysis of Topex/Poseiden satellite altimeter data has provided the most accurate and complete Global Topography data set.